HOLIDAY SEASON DEALS, two special promotions allowing you to get awesome free gifts! drum machine combining the amazing sounds, work flow and creative tools of the Spark Engine software, with the high quality SparkLE controller and you will get 4 expansion packs that are add-ons loading extra kits into your SparkLE software. In the end it will allow you to use 120 high quality new kits & 1920 new great sounding instruments (To be delivered to you through download.). Learn more about Arturia Holiday season deals Post a comment ? Driven by iZotope’s award-winning visual selection technology, iZotope Iris is a groundbreaking sample-based synthesizer that harnesses the power of both your eyes and your ears. Discover what’s inside any sound: Load audio into Irisô and explore spectral details that a regular waveform locks away. Highlight what intrigues you: Extract and isolate the most interesting sonic components with a full suite of visual selection tools. Combine the unthinkable: Layer completely diverse sound sources into totally unique combinations - what do a tattoo needle and a swamp bird and a slot machine sound like together? Stay musical: Rely on automatic root note detection to help shape musical material from noise, ambient textures, soundscapes…even mistakes! Throughout November, Iris is available for the special 20% off price of £119.00 / €139.00. Learn more about iZotope Iris savings Post a comment ? 2konkret Live Pack is the second installment of a series of otherworldly textures, transitions, impulses and ambiences that have their origin in our daily surroundings. As a starting point for further explorations 2konkret delivers 104 Instrument Racks that are specifically designed around a variety of found sounds. If it's a windmill and its associated transformer station that delivered a fascinating duet of hum and phasing sounds. Or a barrow loaded with bricks as a perfect starting point for the creation of impacts or low end drones. Then there's the sound of a heater core filled with water and a little too much air, several body noises, animal sounds, machines and engines just to name a few. 2konkret Universal library contains 119 sounds recorded in the field and is organized into 41 categories. Each sound comes with dedicated loop points and loads immediately into any DAW or sample editing app. 2konkret is available to purchase as download for 9.00 Euro. Learn more about Detunized 2konkret library Post a comment ? AudioThing has released Halloween Pumpkins for Native Instrument Kontakt. Halloween Pumpkins features samples and unusual sound design experiments with traditional Halloween pumpkins. You will find spooky bowed textures, creepy hits, plucked rubber bands, a fake transistor organ and of course an experimental impulse response of the inside of a large pumpkin. - 12 Kontakt Instruments (.nki). - 5 Kontakt Multis (.nkm). - Up to 6 Round Robin samples. - 1 Custom Pumpkin IR. - 76 Samples (44.1kHz / 24-bit). - Formats: Kontakt and WAV . - Sample sets including: bowed textures, hits, plucked rubber bands, fake transistor organ. Halloween Sale: until November 1st, 2013, you can use the discount code hallow13 to get a 10% off storewide (where the total in the shopping cart is more than €5). Learn more about Halloween Pumpkins Post a comment ? 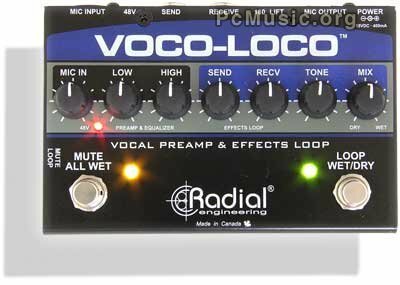 Radial Engineering Ltd. announce the availability of the Voco-Loco, a combination microphone preamp and effects loop insert that enables a lead vocalist, brass instrumentalist or harmonica player to incorporate guitar effects pedals into their signal path. Just like an electric guitarist adds effects for soloing such as delay, reverb or distortion, this option is now available to anyone's performance by engaging a simple footswitch. Learn more about Radial Voco-Loco Post a comment ? Circuit bending is a creative medium that combines technology, sonic artistry and creativity. By altering the internal circuitry of electronic devices such as keyboards, drum machines, and children's toys, circuit benders are able to produce new sounds not intended in the original design. In celebration of this creative curiosity that fueled a young Bob Moog and all of those that follow in his footsteps, Moog is sponsoring its 4th annual circuit bending contest. 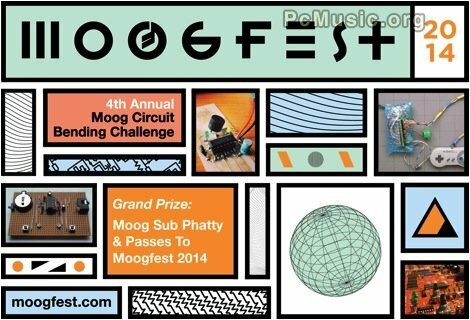 This year, Moog’s circuit bending contest is challenging entrants to take a battery powered device and circuit bend it into an instrument capable of creating new and unique sounds for a total budget of $70 or less. Entrants will create and post videos on YouTube featuring their completed instruments and documenting the process of their creation. Moog will select three finalists and invite them to showcase their creations at Moogfest in April of 2014 where Moog’s judges and the general public will decide a winner of the contest. 3rd Place: Moog Minitaur & Two Passes to Moogfest 2014. Learn more about Moogfest Post a comment ? PcMusic is an independant source: All news are posted by our members. Don't hesitate to submit a news.